For its 2008 range of FM transmitters, Griffin introduced SmartScan and more compact designs. We loved SmartScan when we first encountered it on the iTrip Auto. It's a one-button search tool that scans the airwaves for empty spaces and remembers the three best frequencies. You then select one of three presets and tune your radio to that frequency. 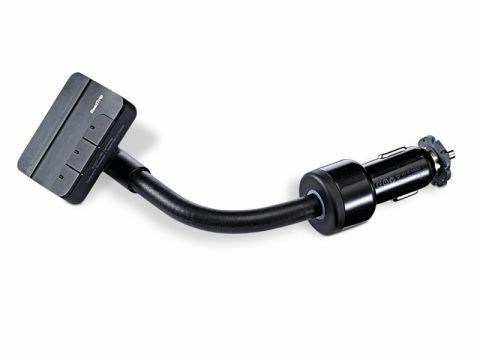 The only real difference between the RoadTrip and the iTrip Auto is the former has a flexible arm for docking the iPod; the iTrip Auto uses a long, loose cable. The arm is smaller on the 2008 RoadTrip than the 2007 model, but we found it tricky to use in our Nissan Micra - due to the position of the gear stick and cigarette lighter, it was an awkward fit. The technology is first class, so depending on the type of car you have, and the dimensions of the RoadTrip, it could be a better fit for your needs. Sound quality, signal strength and build were all great.